I thought I would share our weekend at SERG Mt Gambier Fox Hunting Convention. Kerry and Liz were learning to navigate as Luke (VK5UDX son) is working in Hayman Island. 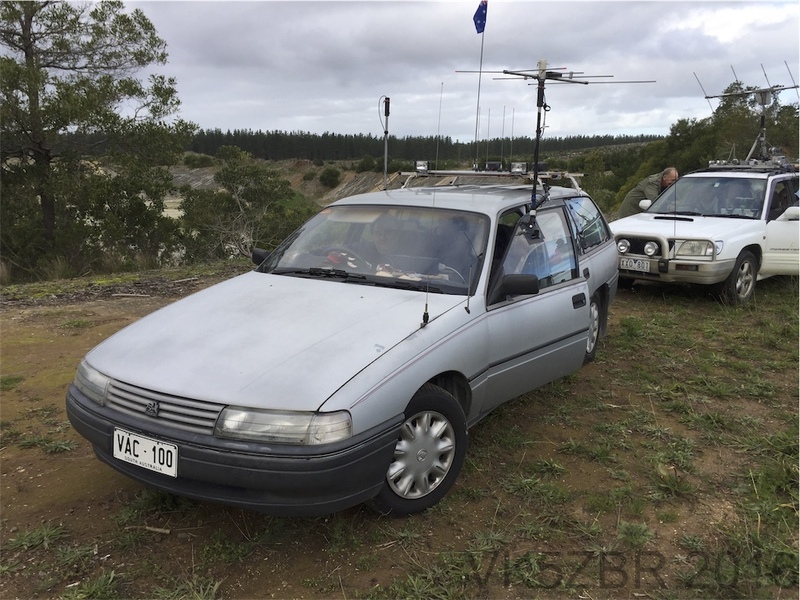 There was two other VK5 teams: VK5TV (Bevan and his wife who upgraded to a Prado this year) and VK5FAB (Ken and Paul Burns and extended family). This year we decided if were changing navigators we would try something new with the receiver side of things. After last years 23cm efforts of not even being able to hear the fox we decided to try SDR technology (as the winning VK3 team last year was able to see that the 23cm was way off frequency). The SDR did work well but it was not what I was expecting. 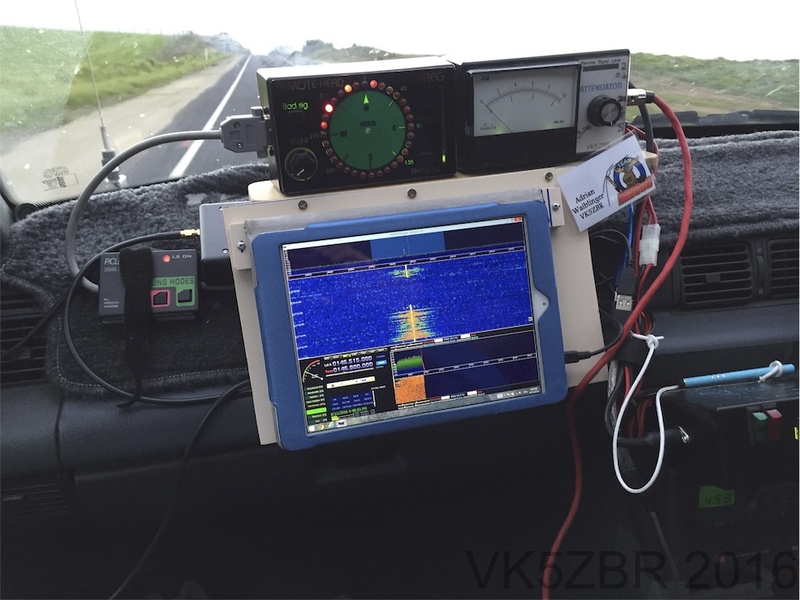 Have you ever tried to DF with a yagi or loop on a SDR using HDSDR? It’s a real mind bender! It’s like you have a rubber band coupling on your antenna. Everything is delayed but by the end of the weekend I got the delay (latency) down quite a bit by lowering the bandwidth to 200KHz and lowering the sampling rates etc. When the going got tough or my mind bent too much I went back to my trusty ammo box DF radio I built in 1994. Event 1 was the 10 Leg ARDF in Marist Park (crater), very hilly and great to hide foxes. Our team split up into 3 groups (Mike and I were on our own and the rest as a collective group). You have your yagi’s, DF radios and get two hours to complete the hunt. Most of the time you’re at a brisk walk or a jog and you get very quite wet in the tall scrub or rain. I did very well getting 7 after making a mistake that cost me a bit of time. The others did very well as finding 6. Event 2 is the horrible 4 leg FM transmitters on the same frequency with CW ID’s in any order. They come up at 30sec intervals after each other and sometimes they get out of sync which does strange things to the Doppler. The audio comes out as a horrible ripping sound when they over lapped, which the SDR can see but this doesn’t help with direction. We took too long on the first one and ran out of time to get all 4. Event 3 was the Wane Kilpatrick Night Hunt (5 Legs) and is the event we all look forward to as it’s fun and can break you or your car (both which has happened in past years). Just to finish the night is a success. Le g 1 we took ages to find the first 2m leg that was 25km from the start in a forest. The fox did very infrequent transmissions that caused us to over shoot were we should have turned a few times. We felt like killing the fox (some other teams did on air) but we were all smiles when we finally found the fox. 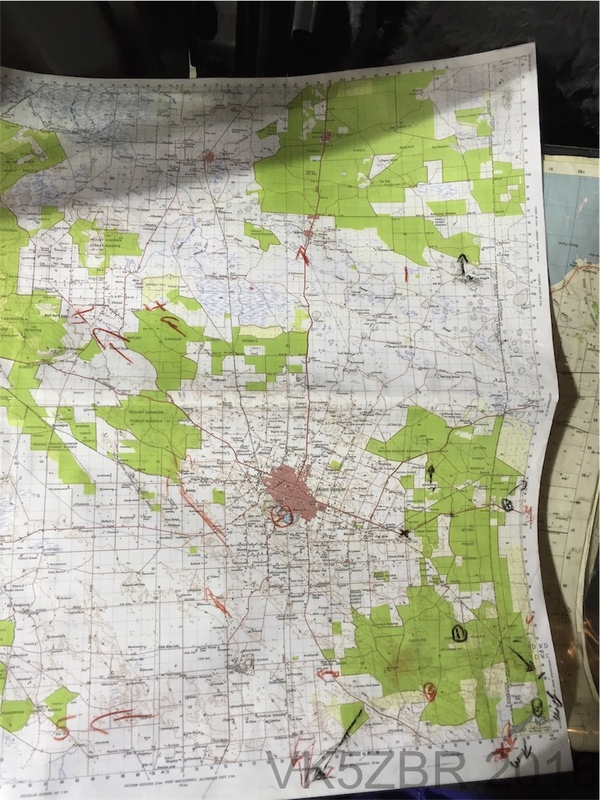 Leg 2 70cm and leg 3 were in VK3 and it’s where our maps kept swapping over. 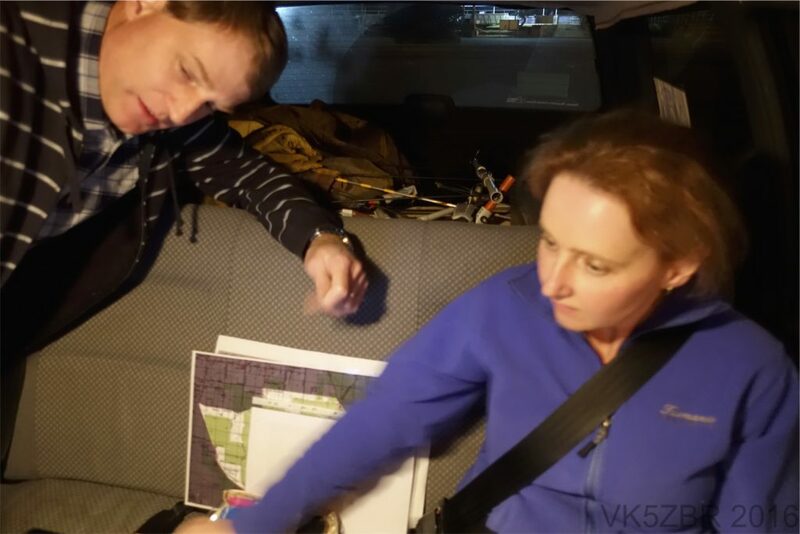 The VK3 maps are not as good as the VK5 maps to start with but Rod VK5UDX and Kerry our navigators did a fine job working out were to go with such poor detail. We basically had to follow our noises through some grass tracks to get to the fox. Leg 4 was the nasty 6m band and ended up being near the Gas pumping station next to a runway strip. The rule to 6m is to get as many good bearing and where the lines cross over is where it is. But if they are play trick on you it’s not. Hmm tricky and not being in the clear makes is a challenge but we found him after an hour looking. Leg 5 the 10m leg, this band just goes a long way. This was our easiest leg, we had 35min to find him and we did with 5min to spare. 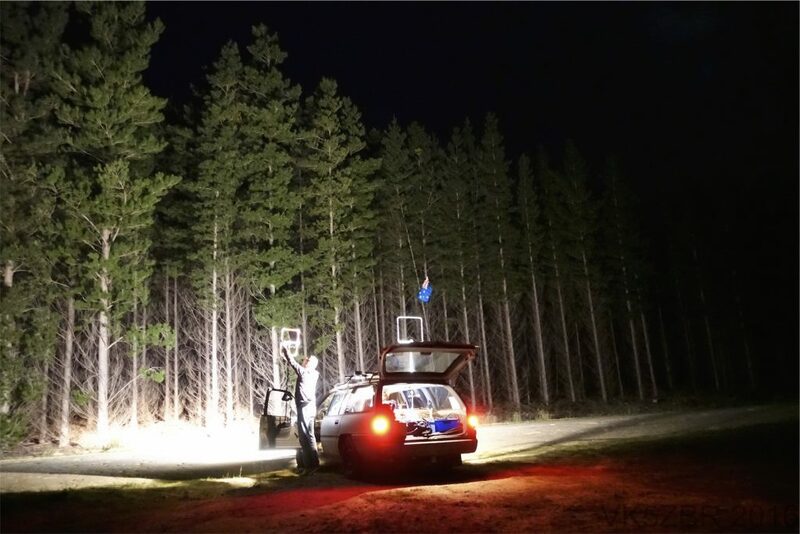 He was set up in the car park on the mount it self near town with a 10m squid pole. We were surprise to see Bevan there too on the phone, but he knew where to go as he had found the 10m fox earlier by chance when he was trying to get a fix on leg 2 70cm fox. So after finishing at midnight it was back to the room for some green label and royal crown whisky. Event 4 10 Leg ARDF we did brilliant at this leg all sleeping soundly catching up on zzz’s ! … apparently the teams that got out of bed most of them found the 10 foxes. But sleeping in gave us time to repair the rear wheel rim having a few square sides. A nice rock did the trick and lots of heavy hammering with some filing. Tire pumped up and ready to go. Dam night hunt! Event 5 triple leg – another tough hunt. We thought we started out well but we had some crazy reflections. I still don’t understand what happened here. After figuring this out we headed in the correct direction 20km north instead of west of the mount and found the fox. The next leg was 2m but we could not find him. We tried different locations and nothing and then we heard a few hounds call up on the repeater saying that couldn’t hear 2m leg either. With a few hints we travelled north and could just start to hear the fox on 2m. Looking at the time we knew we would not find the second fox before time was up, especially after hearing he was another 20km north. We reluctantly decided to pull out and head back for lunch for our radio purchases and free Yaesu hats from Ross. Lots of teams bailed too. 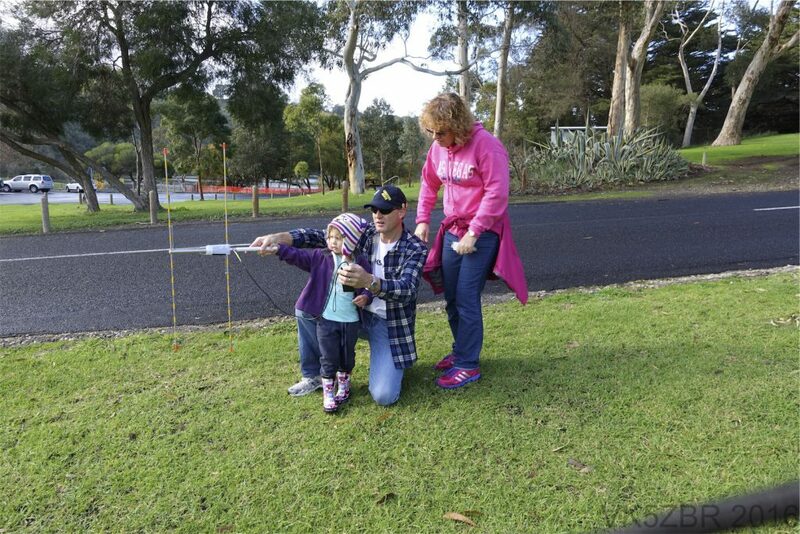 Event 6 triple legs, this hunt requires quick antenna changes. 2m and 70cm we can do with a switch but also requires yagis for loops. To help Rod VK5UDX has leg 2 6m-loop ready to go. Leg 1 – it was a traffic jam but we were a close 4th on this leg. Leg 2 – I changed to my multi band loop quickly but after moving off I couldn’t hear anything but Rod VK5UDX could! I was a bit confused and checked all the receivers then I reconfirmed the frequency and all looked good. I looked up out the window and realised I didn’t connect the dam coax. We just keep going as we were in a race but little did we know the 6m fox had a nasty trick he was playing. He was close by but he was set up near a hill range with a large deposit of iron. It had the effect of a big reflector. The signal got stronger quickly but we ran out of track. The track was on our navigator computer and paper maps but not in real life. Dam we have to back track. I now had the first chance to connect my loop to help Rod VK5UDX out. We were now in territory of confusing signals, my loop is like a yagi but because I had not been able to see the signal progress as we honed in I had no idea which way the signal direction average out to be. Rod VK5UDX could tell but had the 180-degree ambiguity issue now. We picked poorly and went the wrong way. Because of this reflector effect we only knew of our mistake when we drove out of the beam. That was the end of that hunt as we ran out of time. Event 7 23cm hunt, this is another favorite as the fox can do evil stuff with the signal. They use a tin can radiator and can beam the signal to appear in totally different places. But our yagis are like a torch, nice and sharp and are great to DF with. Every body took off but we took our time. Taking quite a few bearing from the top of the Mt Gambier crater to make sure it wasn’t in the crater and these bearings confirmed it was a distance away to the west. The signal was towards the horrible part of the Mount Gambier forest but being 23cm the fox it must be in a clear shot of the start point. We headed in the general direction out of town and then got a massive signal near a school. For about 5 minutes we thought he was around that location. Rod VK5UDX went for a quick run and worked out the fox was doing his trickery. So off we headed due west, down an infrequently used grass track for a few Kms (cleaning the belly of the car) and once in the clear we nearly overshot him, quick reversal and up the top of a hill where we could see him with his tin can and finished 4th. The Convention was capped off with a presentation and dinner at the Scout Hall attended by about 80 people. As part of the presentation VK5PAS gave a talk about the WIA and VK3BLM was announced as the winner over VK3FAST by 2 points. SERG put on a great dinner and allows for a lot of war stories to be swapped and for foxes to let us in on their tricks. It was a great learning experience with the SDR and for the navigators. I think a panoramic display for my DFing receiver will be a better way for me but I still will use the SDR play for overall signal strength and signal confirmation. To be noted we are the only team with a two-wheel drive vehicle and we get there on the good tracks, which are faster. We just made lots of small mistakes this year and had rookie navigators. We don’t take it as seriously as the VK3’s, who are well trained and quick. To have a chance of winning you need to get very good scores on both of the 10leg ARDF and a few first placings. Also, as ARDF is a running type of sport just like orienteering, you need to be fit too. The top teams have young members to help them out. This entry was posted in Fox Hunting by VK5ZBR. Bookmark the permalink.